Kevin Costner has certainly been busy this year - between Jack Ryan, 3 Days to Kill, and now Draft Day, his face has been all over movie posters lately. This movie started off rather poorly, but then, weirdly enough, became better throughout, so that by the end the story was intriguing. There's a small twist at the end too which was rather genius, so the film does get "points" from me for that. Sonny Weaver Jr. (Costner) is dealing with the death of his father from the week before, and now is heading into draft day. He's the GM of the Cleveland Browns, and he already had his pick chosen until the Seahawks' GM (Patrick St. Espirit) throws a wrench into his plans: they offer him their #1 choice slot, which would have been Bo Callahan (Josh Pence), in exchange for the Browns' #1 picks for the next three years. Needless to say, Weaver's staff is not happy that he has accepted this, and at the same time Weaver starts digging into Callahan's past, to make sure he's made the right decision. At the same time, Weaver is dealing with the news of his girlfriend's pregnancy (Jennifer Garner), who is also his assistant at the office, and his mother (Ellen Burstyn) randomly showing up with his ex-wife and his father's ashes, since his father - whom he used to work with - wanted to be left on his football field. This movie would have been better overall if it had just focused on its sports elements. Costner and Jennifer Garner have almost no chemistry in the film, even though they're supposedly dating, and although they're both great actors, the scenes when they're together are the movie's weakest. Costner was very believable as a grizzled General Manager, who recently fired his father before his father died (he has reasons for this, which are discussed later). Ellen Burstyn has a small part here but is always great in her roles, and the three college recruits in the movie were good as well. Maybe see this film. I really liked the ending, and the excitement of the draft day itself, but it took a while to get the movie to that point. Some of the lines throughout were rather corny, so it's not the actors' faults that this film was just okay, but I will say I was surprised by a mini-twist at the end of the movie. I will also say I don't know much about football, and draft days in particular, so I don't know how accurately events were portrayed; so if you are a big sports fan, you might enjoy this movie more than I did. This is a good film to see at a matinee or on a rainy day, but I wouldn't pay full price for a ticket. 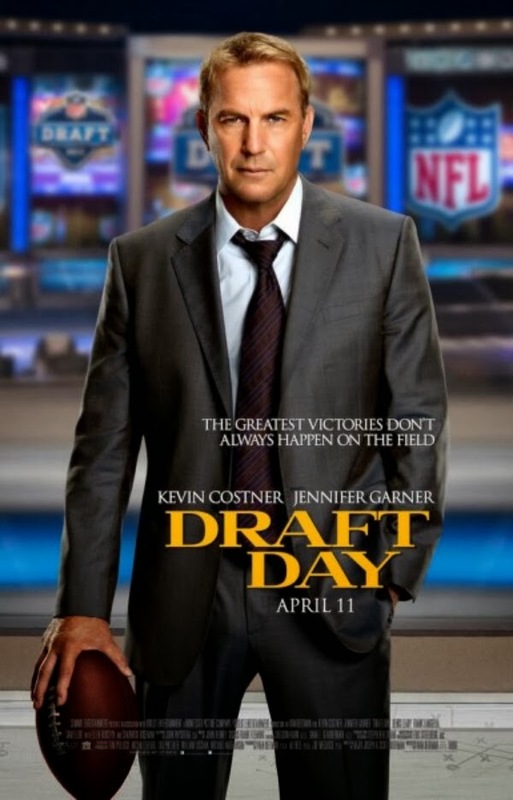 Draft Day is in theaters today, April 11th, and is rated PG-13 with a runtime of 120 minutes. 3 stars out of 5. I actually liked the sports parts a lot. I just felt that Garner and Costner had like zero chemistry. It's tough when a movie tries to be more than it is - in this case a romance and a sports film. Your review is very good - thanks! This movie wasn't as bad as I thought it was going to be. But I totally agree with the points you brought up!